Whether you like it or not, the cold weather is on its way! Minimize your chance of a breakdown or collision by making sure your vehicle is ready to take on the drop in temperature. Join Freeway Auto Body as we highlight four tips you can use to prepare your vehicle for the winter months ahead. Now’s the time to make sure your battery is in good working condition, as it’s tougher for a battery to start an engine in cold weather. A repair shop can test your battery’s ability to hold a charge, make sure the cables are firmly attached and check for corrosion on the terminals. This kit will help you to brave the elements if you find yourself stranded for an extended period of time. Winter tires are a great investment if you live in an area that gets a lot of snow or ice. As soon as the temperature drops below -7 Celsius, winter tires are going to outperform all-season tires. 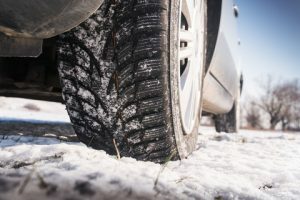 Winter tires help improve your ability to brake in icy conditions and help you get out of that deep snow thanks to their soft rubber and deep treads. If you find yourself dealing with the aftermath of a winter collision, you can trust the experts at Freeway Auto Body to return your car to its original condition. Learn more about our repair process, or give us a call to get a free quote today!